Bacon cut from tasty pork belly, cured in a natural salt brine for 7 days, then smoked with available fruit hardwood for a light and fresh flavor. 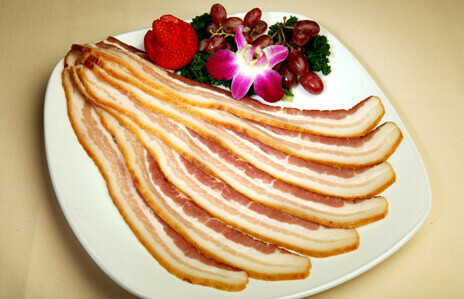 Ribboned with flavor-packed fat, this bacon is sure to be the best bacon you’ve ever had. Our customers recommend ordering at least two, because it will go fast! We do not use sodium nitrate or nitrite additives during the curing process. We do it the old fashioned way with salt and celery powder, two natural curing agents. Callicrate pork bellies and jowls, kosher salt, brown sugar, and celery juice powder.